We're very lucky to have loads of great small museums around our area, staffed by enthusiastic employees and volunteers who do everything they can to keep exhibits interesting and in great condition and in some cases even put on extra fun days. They're also either free or low cost, although obviously leaving a donation helps to keep them that way. One of our favourites is the Hastings Museum and Art Gallery. We've been twice in the last couple of weeks because they currently have a fantastic display of coral reef photography and objects which is a great thing to stop at on the way down to the aquarium. Museums shouldn't be a dull experience that parents force unwilling kids around. The key I think is to introduce them to visiting regularly while they're as young as possible and understand that they may spend ages in one area and show no interest in others. Any idea that you might get a chance to gaze at exhibits and read the information yourself should be abandoned at the door as you will spend a large portion of your time chasing small people and trying to speed read signs so you can answer their questions about the things that have caught their attention. 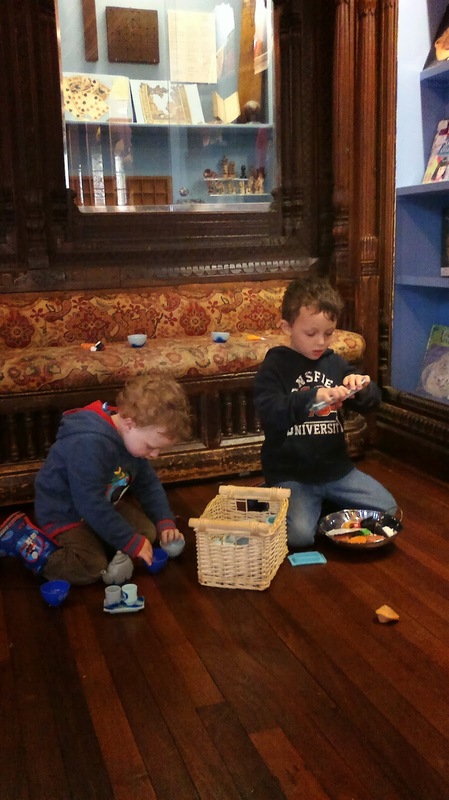 Hastings Museum is very well set up for children because it provides stopping places where you can sit and do an activity and gather your wits. It is also very accessible and has good toilets. 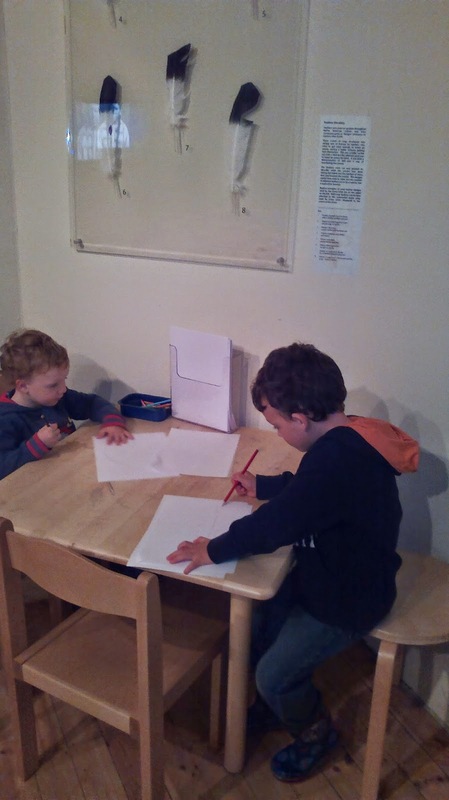 We love the drawing station - getting Ollie to pick a feather to draw means he actually focuses enough on the exhibit to ask questions and listen to the information about them. We particularly like the little Japanese tea set in the dressing up area. There are a selection of world story books there too so it is a good chance to read traditional stories or look at celebrations from different cultures. Toby's favourite areas are the dinosaur gallery. He likes to pretend the Iguanodon is nibbling his fingers, pressing his hand to the glass and then pulling back and shouting 'ow, bit me' and laughing while holding his hand up for me to inspect. The kids love familiar routines, so are happy visiting the same museums over and over in a way that might drive older kids or adults round the bend. Much as we love the occasional foray up to the big museums in London, these small local museums are actually of greater enjoyment to the kids in many ways because they tend to be much quieter so you can actually get to see the exhibits in your own time, rather than being swirled along by a crowd. Your local tourist information office will be usually able to give you a map with all your local museums and other attractions marked on, and being close at hand means that even if your little ones are in school you might be able to pop in for an hour before dinner. It's also worth asking what activities they have for children since they are often used as venues for baby and toddler group activities or have extras on during school holidays.